WonderCrete™ is the world’s first truly water and solvent-repellant coating for concrete, masonry and wood. When mixed with Portland cement it creates a durable and flexible polymer concrete. WonderCrete™ can protect or resurface concrete, brick, stone, stucco, asphalt, wood and metal surfaces. It can also be used to hide stains, patch damage from ice and salt and for use in unique concrete stenciling applications. Water-based and easy to apply, WonderCrete™ is a simple way to keep interior and exterior surfaces looking good for years to come. Best of all, restoring your concrete project with WonderCrete™ can save you up to ten times the cost of replacement or more! 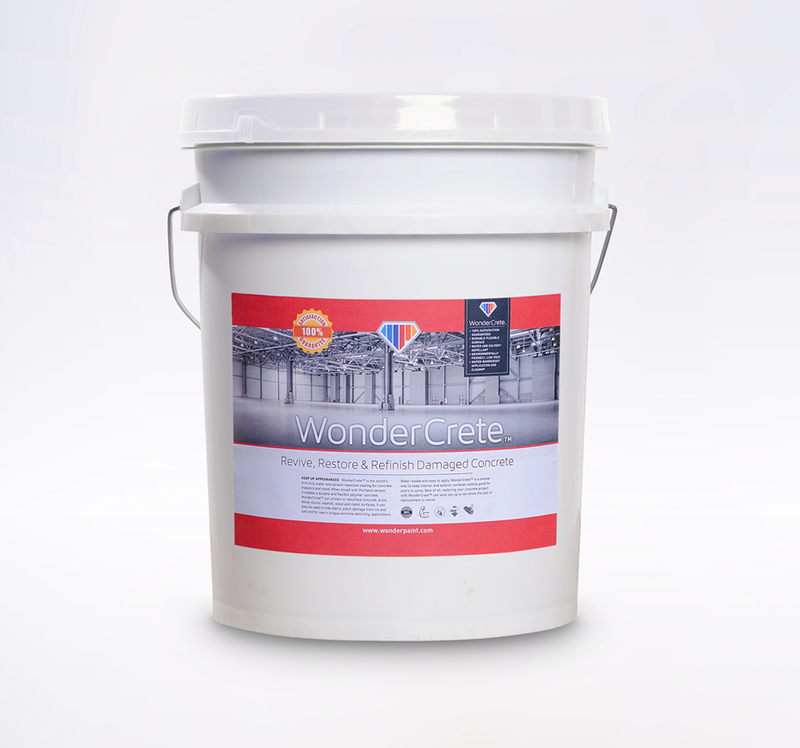 100% SATISFACTION GUARANTEED WonderCrete™ protects concrete from the damaging effects of water, oil, solvents, ice, salt, mold, tree stains and ultraviolet radiation, keeping the surface attractive for many years. DURABLE-FLEXIBLE SURFACE WonderCrete™ forms a protective cement coating that is tough, elastic, flexible and breathable. This permeable new surface won’t become brittle, chip, flake or peel. WATER AND SOLVENT-REPELLANT WonderCrete™ is water-repellent and permiable. Once applied, the surface is protected from threats like oil and grease which won’t soak in and can be washed away. ENVIRONMENTALLY FRIENDLY, LOW VOCS WonderCrete™ is environmentally friendly, non-toxic, readily biodegradable, non-flammable, VOC-free and safe for the environment. WATER-BASED - EASY APPLICATION & CLEANUP When mixed with dry Portland cement and water, WonderCrete™ is ready to use within 20 minutes. The mixture is easily applied with a brush, roller or sprayer in two or more thin coats and is easily cleaned up with soap and water. The combination of the qualities of the WonderPaint products is not seen in competitive products. The technology behind the WonderPaint products make them extremely durable and very easy to work with which allows us to accurately predict our labor costs on every job. I would highly recommend these products for any applications that require strength and durability. They are easily applied to metal, wood and concrete and gave a uniform look throughout the entire project.